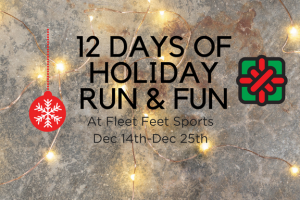 Get in the spirit this week with our 12 Days of Run & Fun. We hope you can join us! Wed Dec 20: St. Nike Fun Run. Join our fun runs at either store at 6pm for up to 5 miles. One lucky runner at each store will leave with a Fleet Feet/Nike gift card! Thur Dec 21: Coasters & Coozies Giveaway. Join our pub runs at either location and grab this free giveaway provided by Hoka One One & Fleet Feet Sports. Meet us at 6pm for up to 5 miles for all paces, Funks Pub Fitchburg or Great Dane Eastside. Holiday Hours: Sunday Dec 24th Open 11a-3p. Monday Dec 25th Stores are closed. It's going to be a great holiday week!